If you enjoy playing poker, horse racing and want to help make a difference, then Monday night’s Leg-Up Fund charity poker tournament at Canterbury Park is right up your alley! The Leg-Up fund was founded with cooperation between Canterbury Park, the jockey colony and the various horsemen’s groups in order to raise money to help injured jockeys here at Canterbury. While the potential need is always hovering in our sport, the reality struck close to home last week when jockey Hugo Sanchez was unseated at the beginning of the last race Sunday and broke his leg. Surgery was necessary and he will be out of work for months. Jockeys are independent contractors and when they don’t work, they don’t get paid. Like everyone, jockeys have families to care for and bills to pay and Leg-Up Fund is there to give them a hand in their times of need. But it can’t without your help. 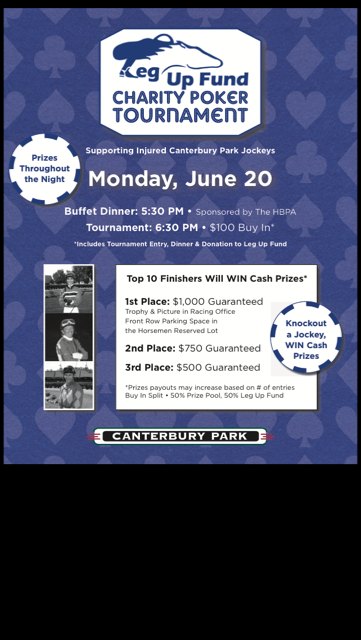 While June 26 is Leg-Up Day at Canterbury with all kinds of fund raising events taking place, the poker tournament on Monday will kick off the week. The $100 fee includes your donation, buffet dinner and tournament buy-in. Additionally, I would ask the Club if you all are comfortable with us donating $100 of our balance (about $30,000) I will go ahead and do that next weekend on Leg-Up Day. Please vote below when you have a chance over the next week. This entry was posted in 2016 Racing Club and tagged Leg Up Fund by tlgrevelis. Bookmark the permalink. How do we register for the poker tournament? I say we give at least $500. If we want to be owners we owe the people that help make it possible. It’s only about $3 a person. If that means $6 per person would be $1,000 let’s do that! Just can’t believe that we have some owners who voted no to this worthy cause. Keep in mind that this isn’t a closed blog, so anyone that reads can vote (my mistake there, but vote was still overwhelming) so it could be just some jokers. Our little gang is pretty solid!